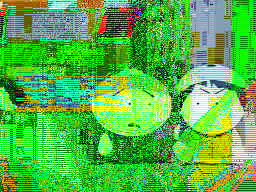 I recently bought a new graphic card because my old one probably broke down. They're not really expensive anymore and I am not a gamer - so a 256MB ASUS EAH 2400Pro would make it. Uwah! What happened? First I thought the graphic card might be broken which was a stupid thought because Windows XP worked well and pictures and everything were displayed just fine. So my second guess was to install the newest driver from the ASUS website. I was pretty sure that would do it but after a successful driver update I still got the green videos. Annoying! Today I finally found the solution! The final hints were given me from this german forum. I didn't read the whole thread but some hints gave me the solution. On your desktop make a right-click and click on "Settings". In the now opened window change to the tab "settings". In this tab click on "Advanced" in the right lower corner. 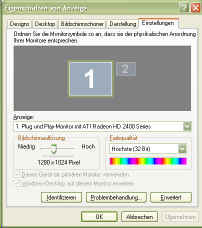 A new window will open which is called something like "Settings of plug and play monitor...". Here's a tab called "ASUS". Click on this one. You will have two tabs within. One called "ASUS OSD" the other one "ASUS Splendid". 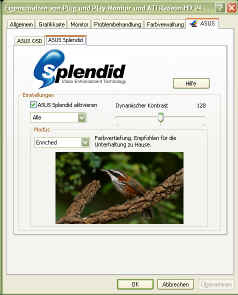 Click on "ASUS Splendid". Here's the bad thing! You have to deactivate this Splendid thing with check button in the section "settings". Apply your change and leave the windows with OK.